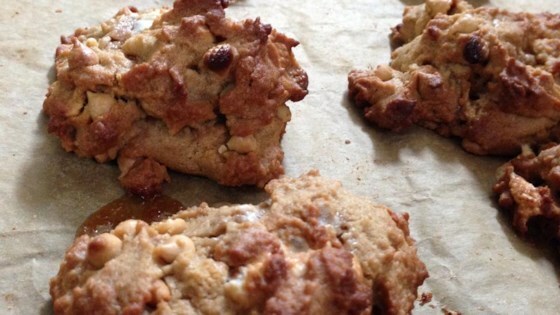 "These cookies have a slight nutty flavor without actually having nuts...great for kids who don't like them! Gooey and delicious!" In a medium bowl, cream together the peanut butter, shortening, and brown sugar. Stir in the egg, milk and almond extract. Sift together the all-purpose flour, rye flour, baking soda and salt, add to the creamed mixture and mix until just combined. Finally, stir in the chocolate chips and mini marshmallows. Drop cookies by rounded teaspoonfuls onto the prepared cookie sheets. Bake for 8 to 10 minutes in the preheated oven, or until golden brown. Allow cookies to cool for 1 minute on the baking sheets before removing to wire racks to cool completely. Great recipe! I always add my own touch to a recipe! I added 1 tablespoon vanilla extract and I used chuncky peanut butter. Great! Wasn't impressed, the balls were so greasy and they capsized if there was a marshmallow in the middle. Also, no matter what I did the bottoms came out burnt! Not a repeat! These are excellent cookies. I used peanut butter chips instead of chocolate chips, since I'm trying to cut out caffeine. My husband loved them, and so did a friend whom I gave some to. Delicious! Just reduce the amount of almond extract, it's a bit overpowering. The other ingredients are so nice it's a shame to cover them up.